A subdomain is a unique identifier with a domain name to become essentially a “domain within a domain.” For understanding better with below example also information about how to Create subdomain in Plesk Panel, cpanel & Website Panel. One domain name : reseller99.com ==> The main website for Reseller99. Now Company having more department such as sms, blog, web hosting, domain, etc. All the above link are subdomains of the domain reseller99.com which are point to particular department. How to create subdomain in PleskPanel ? Step 4 ⇒ Fill with suitable subdomain name and select the physical hosting path. How to create subdomain in WebsitePanel ? Step 1 ⇒ Login to the website panel. Step 2 ⇒ If you are in Admin Panel. Step 3 ⇒ Click on the particular customer and click on the domain name. Click on the Domains icon. 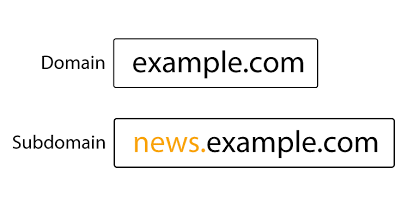 Step 4 ⇒ Then Click on Add Domain. Step 5 ⇒ click on Sub-Domain. How to create subdomain in cPanel ? Step 1 ⇒ Login to the cPanel. Step 4 ⇒ Under Domains section please click on subdomain and create subdomain.